Bumblefoot, also know as Pododermatitis is an infection of the foot pad coursing swelling and can be crusty and or bleeding. Bumblefoot is extremely painful guinea pigs will often walk around as normal and not show any pain but not be fuelled this condition is extremely painful. If this condition is left untreated the infection may develop in the bone coursing Osteomyelitis (infection in the bone) If this happens your guinea pig will need to have his/her foot/leg amputated (surgically removed).. If Osteomyelitis (infection in the bone) is left untreated the infection will get into the blood coursing death. 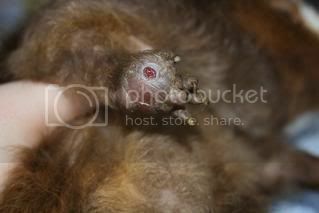 If Bumblefoot is left untreated it will lead to a slow painful death. 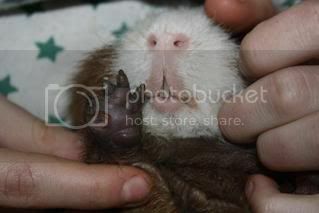 If you suspect you guinea pig has bumblefoot we recommend you see a cavy experienced vet asap. If your guinea pig is suffering from Bumblefoot (Pododermatitis)we recomend you go to your cavy experienced vet asap to get a full health check and to find out what is the best treatment for you guinea pig. What is my vet likely to do? Your vet is likely to do an x-ray to conform that your guinea pig dose or dose not have Osteomyelitis (infection in the bone). Your vet should conscribe an oral antibiotic like Baytril or Doxycyline and should also provided you with a pain killer like Metacam. We also recommend you do daily foot stokes in betadine 3 times a day It is also possible to dressing the foot to help keep the wound clean..